"For the last time, who is this HERNANDO? Look toots, you can sit there all pretty 'til the cows come home, but my standard fee is still $500 a night. Now pay up so I can blow this joint. 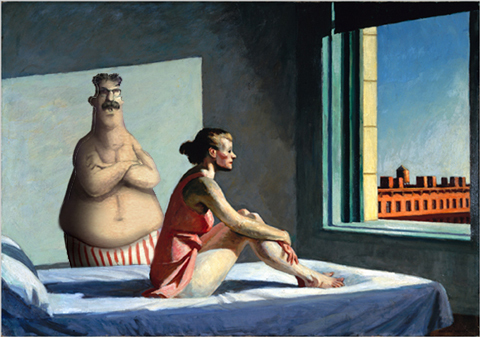 I have always liked Edward Hopper and I really like this update. John, adding the modern "everyman" is brilliant! And we can have fun with it! Rod Stewart was right - the morning sun, when it's in your face, really shows your age. Ed couldn't understand what happened to the love. I thought it would be fun to take a Hopper classic and bend it. Thanks for noticing. "OK,OK. I'll admit it - the Allentown Ramada ain't no Disney Orlando resort but you have two choices: you can sit here all day and sulk or put on a sun dress and go with me to the Hibiscus Lounge downstairs and enjoy the Happy Hour pierogi buffet, a nice 2-for-1 cocktail, and the swinging music of Frankie Frankowski and The Polka Princes." Doc Al KNOWS how to PARTY! Yet again you've contributed some wriitng that lens itself to the first line of an edgy short story. Thanks, John. I used to write short stories for fun and really need to get back to it. In my high school senior English class, the teacher had us look at a picture and write a one-page short story about it. In my mind, I guess I still do that, I just don't put it down on paper. Maybe we should collaborate? Definitely has some possibilities. Love to chat about it. ROFLLLLLLLLL I sure didn't need any words for this one. I'm sorry, Ed. Last night was magical, but I can't see you anymore. You and I are from different times, different worlds. Water color and pixel. Realist and caricature. Besides, what would the children look like? "Look lady. I would do anything for love, but..."
What? So I looked a little slimmer at the Nighthawks Cafe last night-this is who I am baby! THERE"S the art history reference! Nice going. Wow, John, that is a strange juxtaposition and some major bending. "Once you've been with Roy Biggins, you don't want another man." "If I had the energy, I would have done it all over the county." "I use almost pure turpentine to start with, adding oil as I go along... I use as little oil as I can... that's my method." "Don't blame me. I wanted to do it in the Reinhardt." This page contains a single entry from the blog posted on January 23, 2013 1:54 AM. The previous post in this blog was The Oath.